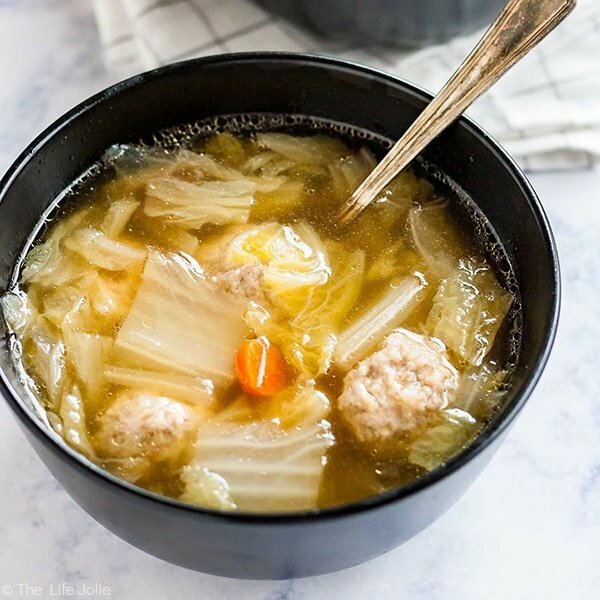 This Cabbage and Pork Meatball Soup is easy to make and full of great umami flavor! It’s an Asian-inspired recipe that whips up pretty quickly and with savory, mouthwatering flavor! One thing you may not know about the blogging community, is that unlike many other industries it is extremely supportive and friendly. It’s just that: a community. I find that the vast majority of other bloggers that I’ve been in contact with are so gracious and eager to help each other and collaborate. 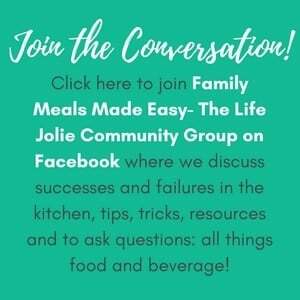 I am part of a small group of other bloggers friends on Facebook. We communicate on a daily basis and are there for each other through the peaks and valleys of our blogging journey (major takeaway: find your tribe!). It has been such a game changer for me as a blogger and as a person! I am extra excited to share that one of these friends has her first cookbook being published and released on May 23rd! 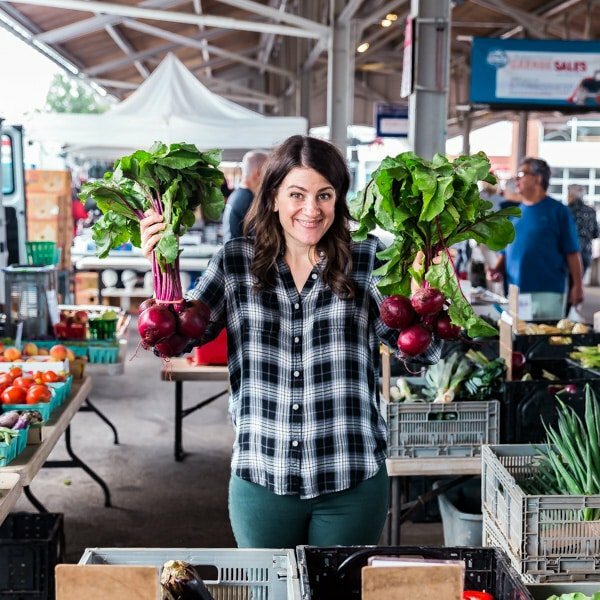 Charmaine is the blogging mastermind behind the blog Wok and Skillet. She was born and raised in Malaysia and although she spent much of her life in the USA, she currently resides with her family in Penang, Malaysia once again. Charmaine has a wealth of knowledge about Asian cuisine, so it was no surprise when a publisher reached out to her to collaborate on a cookbook. And thus, The Healthy Wok Chinese Cookbook was born. Now I have actually been lucky enough to get to test a few of the recipes that are in this cookbook, and let me tell you- there is some major deliciousness happening here. 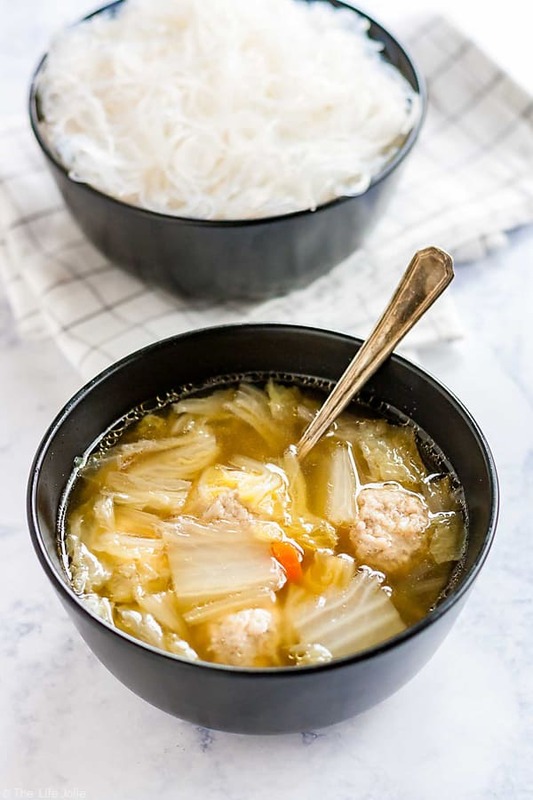 I love to eat Asian food in general- there are so many different facets to Asian cuisine from a variety of different countries and I truly love this melting pot of flavors. Sadly, I don’t cook in this style very often, but that has everything to do with the fact that I am a total newbie in this area and severely lack the knowledge to do justice to these fantastic dishes. And that’s another thing I love about this cookbook (which I was able to read recently). This book contains a slew of fantastic recipes- 88 to be exact, which Charmaine tells me is a lucky number in the Chinese culture! She provides a comprehensive guide to all facets of this style of cooking. In short, you’re also getting a crash course in Chinese cooking from an expert! 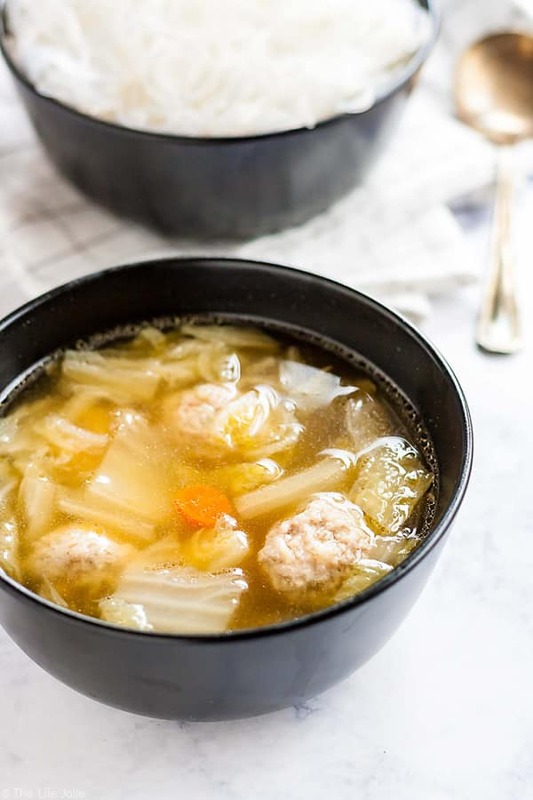 Testing these recipes was such a fun experience for me and I absolutely fell in love with this soup that Charmaine has so graciously allowed me to share with you. The flavor is seriously off the charts in all of it’s umami goodness. Those tender and delicious meatballs are not to be missed (side note, I never would have thought to include shrimp and pork together in a meatball- my mind was blown in the best way possible!). The comfort-factor is at an all-time high and when I brought some of it to my Mom and Dad, they were pretty enthusiastic about the results! And the fact that it cooked up super quickly and easily also played a part in me practically begging Charmaine to share this recipe once the book because available to the public. Now, The Healthy Wok Chinese Cookbook is officially available for pre-order! I strongly encourage you to scoop this cookbook up and get your cooking on! This giveaway has ended but you can still purchase The Healthy Wok Chinese Cookbook – trust me- it’s amazing! Even more exciting is that Charmaine has agreed to giveaway one (1) cookbook to a very lucky reader! Details: This giveaway will run through 5/18/17 and a winner will be chosen at random and contacted via email to obtain a shipping address. 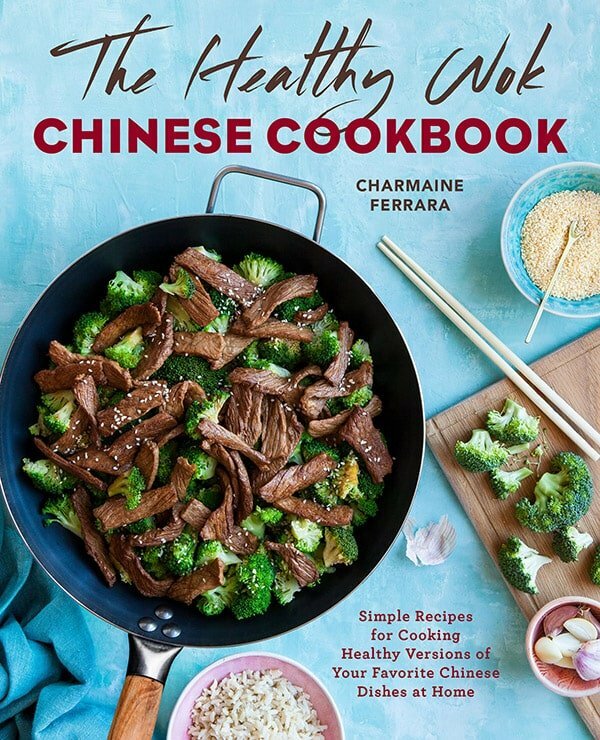 Terms and Conditions: One (1) copy of The Healthy Wok Chinese Cookbook: Fresh Recipes to Sizzle, Steam, and Stir-Fry Restaurant Favorites at Home by Charmaine Ferrara ($14.97 value). The winner will be notified via email on or around 5/19/2017. This giveaway is only open to legal residents of the 50 United States and District of Columbia who are at least 18 years old as of the date of entry, except anyone directly associated with The Healhy Wok Chinese Cookbook or The Life Jolie. This promotion is void outside the 50 United States and the District of Columbia, and where prohibited. 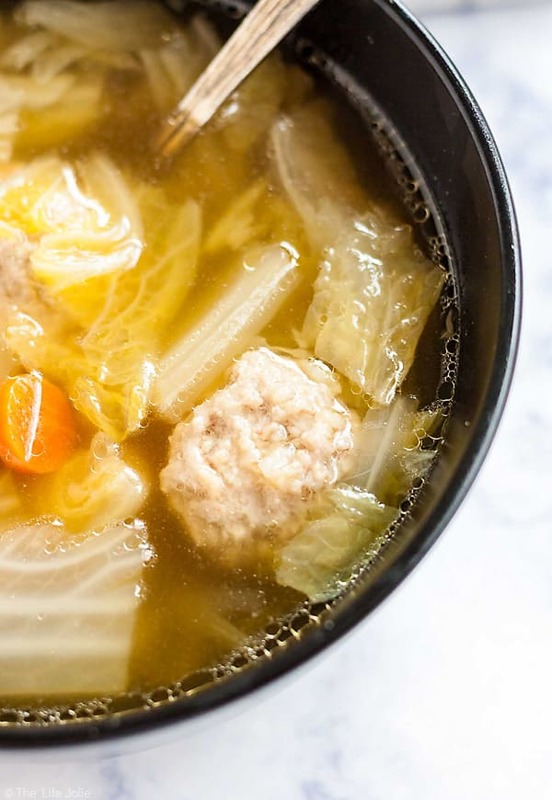 With light, airy meatballs in a flavorful broth, this soup complements any Chinese meal. 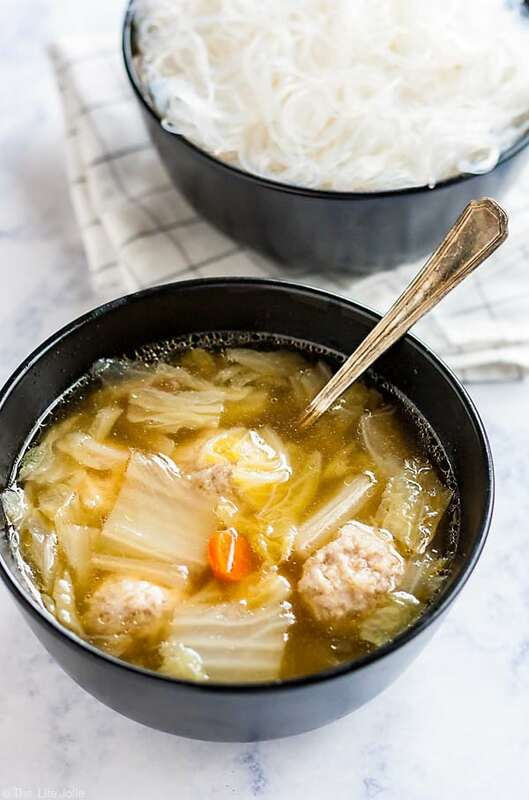 The minced water chestnut in the meatballs gives every bite a nice crunch. Serve with vermicelli or glass noodles for a complete meal. 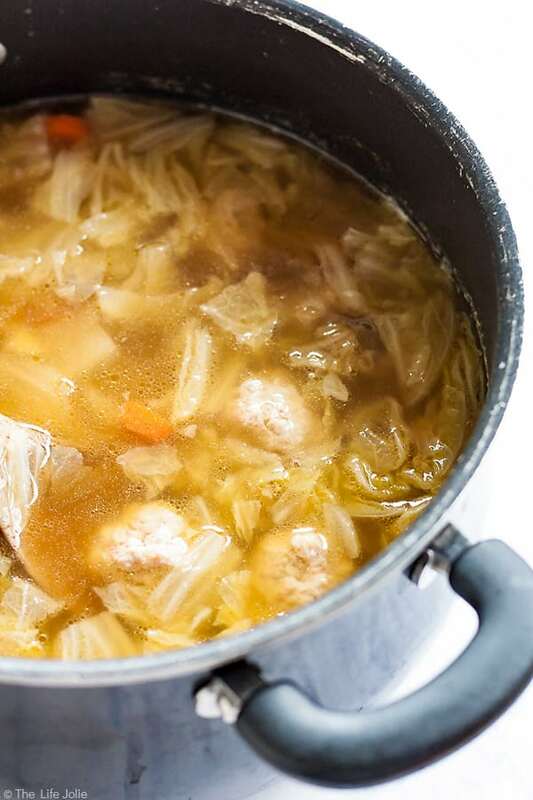 It’s perfect for cold weather, but can be enjoyed in any season. In a bowl, mix the ground pork, shrimp, water chestnuts, soy sauce, sugar, salt, pepper, and cornstarch. Set aside to marinate for about 15 minutes. In a wok over high heat, bring the chicken stock to a boil. Add the cabbage and carrot, and simmer for about 30 minutes. Roll about 1 heaping tablespoon of pork mixture into a ball and continue until all the pork mixture is used. 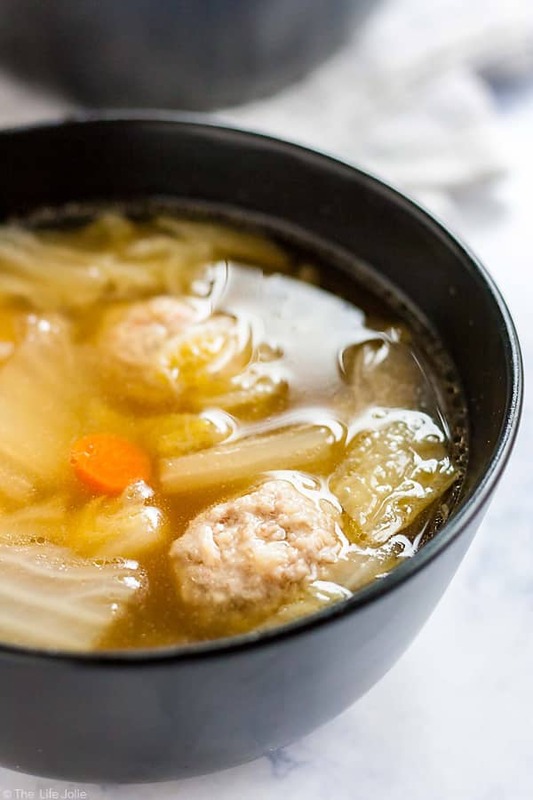 Carefully drop the meatballs into the boiling soup one at a time. Avoid stirring. As the meatballs cook, they will rise to the top. They will take about 3 minutes to cook through. Add the salt, sesame oil, and soy sauce just before turning off the heat. 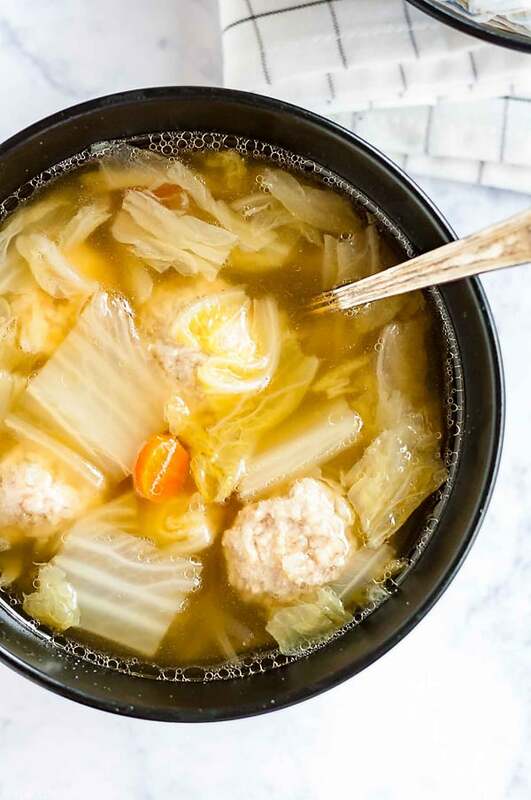 !Variation Tips: Wok-fry the meatballs before adding them to your soup for a different texture and flavor. Also, a few dried shiitake mushrooms will add a luxurious essence to the soup. May 11, 2017 at 9:59 pm Thank you so very much for this post and your support! I truly value you and your friendship. May 12, 2017 at 8:59 am I'm so glad to share it- that soup recipe is amazing and I will seriously be making it over and over! May 11, 2017 at 10:21 pm I have made a few variations of Korean BBQ pork that I just absolutely love. May 12, 2017 at 8:57 am Yum! May 15, 2017 at 1:31 pm My husband loves that! May 15, 2017 at 5:51 pm I love pork chow fun. May 16, 2017 at 8:33 am Is it wrong that it's 8:30am and that sounds amazing to me right now? May 16, 2017 at 8:33 am Yum- a classic! May 15, 2017 at 6:25 pm I love pork lo mein! May 16, 2017 at 8:32 am That's my daughter's favorite! May 16, 2017 at 8:32 am I'm sad to say I've never had homemade eggrolls, but I'd love to try them! May 15, 2017 at 10:08 pm So many to choose from...beef and string beans. May 16, 2017 at 8:31 am Yum! May 15, 2017 at 10:46 pm I enjoy stir fries of every kind! 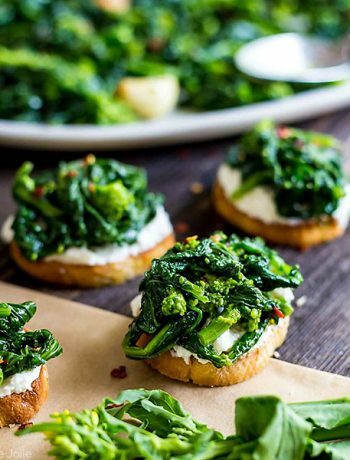 May 16, 2017 at 8:31 am Me too- they make a great weeknight dinner! May 16, 2017 at 6:21 am Sesame chicken is my favorite! May 16, 2017 at 8:30 am I love Sesame Chicken! 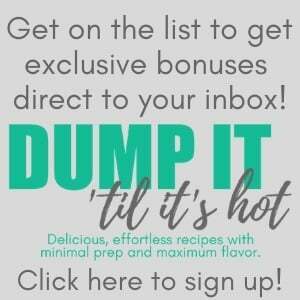 May 16, 2017 at 9:22 am My favorite dish is Honey Walnut Shrimp! But I'm definitely going to be trying this soup! May 16, 2017 at 10:27 am I hope you love it! May 16, 2017 at 11:06 am We are all about some stir fry....especially on clean out the fridge night! May 16, 2017 at 1:47 pm Always a good idea! May 16, 2017 at 1:45 pm Yes! I love lettuce wraps! May 16, 2017 at 1:44 pm Me too! May 16, 2017 at 5:19 pm I'm a really big fan of Hunan Bean Curd! May 17, 2017 at 8:18 am I've not had that but I bet it's delicious! May 17, 2017 at 8:16 am Oh wow, so you got to enjoy truly authentic Korean food- I'm jealous! May 17, 2017 at 9:35 pm So authentic we often weren't sure what we were eating. Life in the military did require moving often which allowed us to explore some very different cultures. May 16, 2017 at 9:02 pm I make a really good sweet and sour, usually chicken. 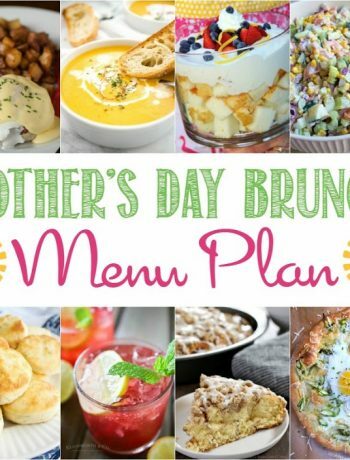 May 17, 2017 at 8:15 am That's one of our family favorites, but I've never actually made it- I should try making it sometime! May 17, 2017 at 8:14 am Yum! May 16, 2017 at 10:21 pm I love tofu that has been marinated in hoison sauce, stir-fryed with fresh veggies. Yum! May 17, 2017 at 8:14 am Yum! I don't make tofu nearly enough! May 17, 2017 at 8:18 am I use the extra-firm, it tastes like barbequed chicken with the sauce - SO good! 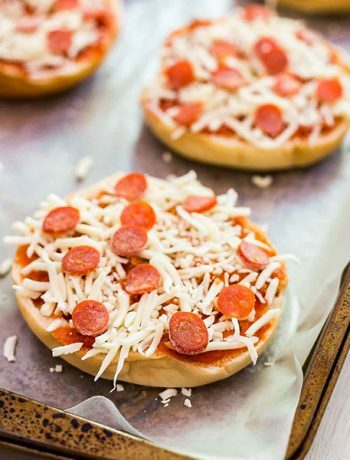 May 17, 2017 at 8:20 am OMG- I'm seriously going to try this- thank you for sharing! I love tofu but Justin is such a picky eater that I tend to only order it at restaurants. I need to make this :) Thank you so much Sandy! May 16, 2017 at 10:55 pm Pineapple cashew quinoa stir-fry! May 17, 2017 at 8:13 am That sounds delicious! May 17, 2017 at 9:55 am My favorite dish is stir fried rice with either shrimp chicken or pork. So good. May 17, 2017 at 1:38 pm I agree- seriously so delicious! May 17, 2017 at 10:38 am I like chicken and broccoli stir fry. May 17, 2017 at 1:36 pm Me too! May 17, 2017 at 4:52 pm Spring rolls with spicy peanut sauce! May 17, 2017 at 10:18 pm I could go for some right now! May 17, 2017 at 8:34 pm I like to make fried rice but sub cauliflower! May 17, 2017 at 9:42 pm .beef and string beans. May 17, 2017 at 10:13 pm Yum! May 17, 2017 at 10:37 pm I like sweet and sour pork. May 18, 2017 at 1:42 pm Me too! May 17, 2017 at 11:09 pm We do our own homemade egg rolls! May 18, 2017 at 1:43 pm I wish I knew hoe to make eggrolls! May 18, 2017 at 1:42 pm Yum!